The trend of buying products online rather than in brick-and-mortar stores continues. In September 2017, Visa reported a 6.5 percent increase in online spending versus a 2.6 percent decrease for physical purchases. Much of the online growth, however, is from Amazon, Walmart, and other big e-tailers. Smaller ecommerce sites have to work harder to stay relevant. The first step is winning consumers’ trust. Trust is earned on many levels. It’s not a clear-cut process. The images, videos, and textual content for products play a big role. For example, a recent study by Salsify, a product information platform, showed that two product listings appearing side-by-side on an Amazon search results page could see drastically different reactions based solely on how the content is presented. 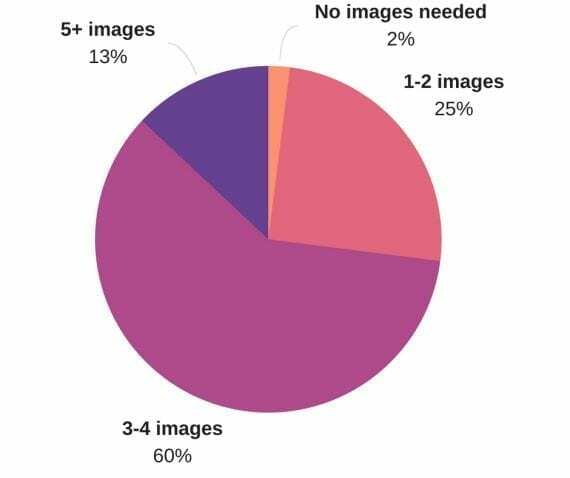 A product listing that includes more images than another will see higher conversions more than half the time, as will listings that include bullet points. 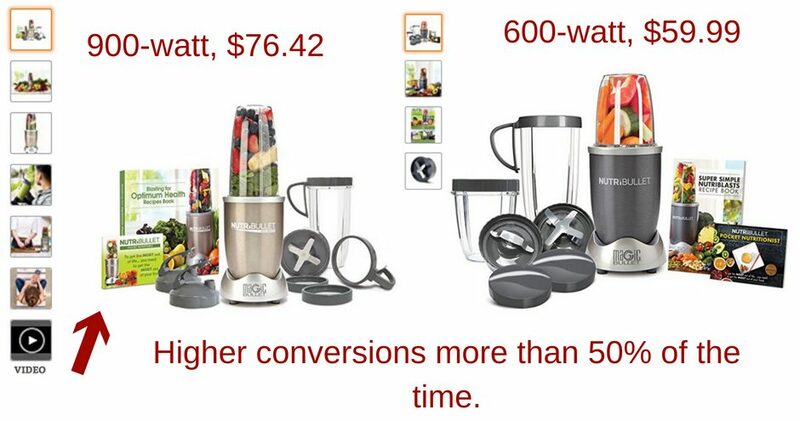 Products that have the most reviews will also convert better. Products with more images and video convert more, even if they have more features than the shopper needs and cost more. Source: Salsify. What other factors influence trust? Here are my top eight. Previous positive experience. Most online stores rely heavily on repeat business. Thus it’s important to deliver great service to every existing and potential customer — from the initial visit to the delivery of the product. Positive reviews for the store and product. Shoppers look for confirmation that others trust the company and like its products. Longevity. When it comes to trust, the longer your store has been around, the better. If you’re new to the market, you’ll need to put extra effort into other factors. Recognitions that matter. It’s nice to know that the site uses encryption and emphasizes secure payments methods. But awards and bestseller badges can pack a punch when it comes to encouraging people to buy. Awards, certifications, and ratings can encourage trust. Many third-party rating-and-review sites offer badges to embed. 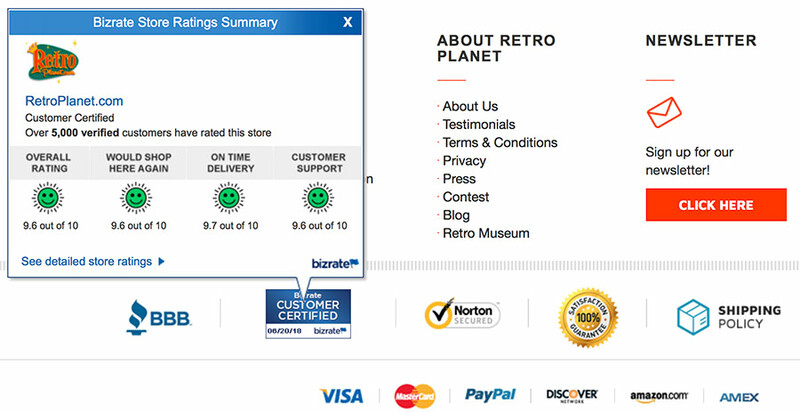 Retailer Retro Planet, for example, displays its certification from Bizrate. Source: Retro Planet. Recommendations from customers, family, and friends. This includes “social only” friends. Be sure to incorporate the latest share and recommendation links and tools for various social networks. These can be placed in the site’s header or footer (for the store itself) and on product and category pages (for sharing products and product lines). Relevant product information. Relevant content includes images, videos, product reviews, textual descriptions (and how they are presented), and user-generated content. While it’s impossible to please all shoppers, targeting the biggest group is crucial. For example, when Salsify surveyed 1,000 online shoppers, 60 percent said they required at least three product images to consider clicking the buy button. Thirteen percent said five or more images were necessary. More images mean more sales. A Salsify study found that 60 percent of consumers required at least three product images to consider clicking the buy button. Thirteen percent said five or more images were necessary. Many payment options. Accepting multiple forms of payment isn’t solely about providing options. Savvy shoppers know that some payment methods aren’t as easy to offer as others. For example, nearly any business can accept Visa and Mastercard. American Express and Discover, though, have stricter standards. Some mobile payment options, such as Apple Pay, go through additional verification processes, and a site that fails to meet shipping and other guidelines is more apt to have its account revoked. comScore, the research firm, found that 63 percent of online consumers look at a store’s return policy before making a purchase, with nearly half of them saying they’d buy more and recommend an e-tailer if it has a lenient policy. Other studies show that people are willing to pay more for a product if there is a hassle-free return policy. Kohl’s has a liberal return policy — return almost anything at any time. The store makes it easy to return items by visiting any Kohl’s store or mailing the items back. With stiffer competition and shoppers’ higher standards, building trust should be a priority for any store. Take the time to revisit store policies and product descriptions. Find ways to encourage visitors to share product pages to the people who trust their opinion.